Head to Damnoen Saduak Floating Market and Siam Paragonfor some retail therapy. 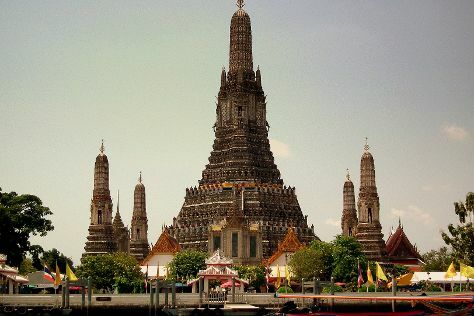 Deepen your sense of the past at sights like Temple of Dawn (Wat Arun) and The Grand Palace. Change things up with a short trip to Bang Saen Beach in Chonburi (about 1h 45 min away). Spend the 8th (Sat) exploring nature at Dong Phayayen-Khao Yai Forest Complex. There's much more to do: get in on the family fun at Safari World, shop like a local with Chatuchak Weekend Market, soothe aching muscles at some of the top local wellness centers, and contemplate in the serene atmosphere at Wat Saket. To see reviews, other places to visit, traveler tips, and more tourist information, refer to the Bangkok travel itinerary creator. In July, daytime highs in Bangkok are 39°C, while nighttime lows are 30°C. Cap off your sightseeing on the 8th (Sat) early enough to travel back home.